Insulated Conservatory Roof Systems – Use your conservatory yearly! With conservatories becoming more common and prevalent in 2018 it is important that you are able to use your conservatory throughout the year with no problems. Insulation is a big talking point within the conservatory industry and as with anything some roofs excel in insulation and others fall short. Without having the correct insulation your conservatory will be left to varying weather conditions and if the following winter is like the recent conditions we have seen will mean your conservatory is unusable during the winter months. This post is here to explain a bit about insulation and how this is important when choosing which conservatory roof to get and also bit about the Guardian Solid Roof that we offer here at Guardian Roofs UK. If you have any questions about the Insulated Conservatory Roof Systems we use here at Guardian Roofs then please get in touch with a member of our team today and we will be happy to answer any questions that you may have. Insulation is important in every part of a building and conservatory roofs are no exception – insulation provides buildings with the ability to retain heat, use less energy and perform in an energy efficient manner. When it comes to conservatories traditionally they are built using glass and polycarbonate materials. When looking at these materials it is clear to see that there is not much scope to provide insulation to your conservatory. The thin layer of glass or polycarbonate is all that stops the cold from flowing in and in the summer months allows the suns rays to easily enter the conservatory. Insulation is even more important for conservatories for two main reasons. Firstly, during winter months the lack of insulation between the inside of the conservatory and the exterior elements can mean that your heating bills will see a big increase due to the amount of energy needed to keep your conservatory warm. Secondly, during the summer months, insulation acts as a blockage for unwanted sun. It prevents the rays from entering the conservatory and on a warm summers day if your conservatory is made from glass it will result in your conservatory essentially turning in to a greenhouse meaning that you are unable to use the conservatory. The roofs that we use here at Guardian Roofs are thermally insulated to a maximum U-value of 0.18 W/m²K. How does the Guardian Warm Roof insulate your conservatory? As mentioned above the Guardian Roof System is thermally insulated to a maximum U-value of 0.18 W/m²K. A U Value is the figure given to how well a material is as an insulator and the lower the value the better the insulation properties of the roof. 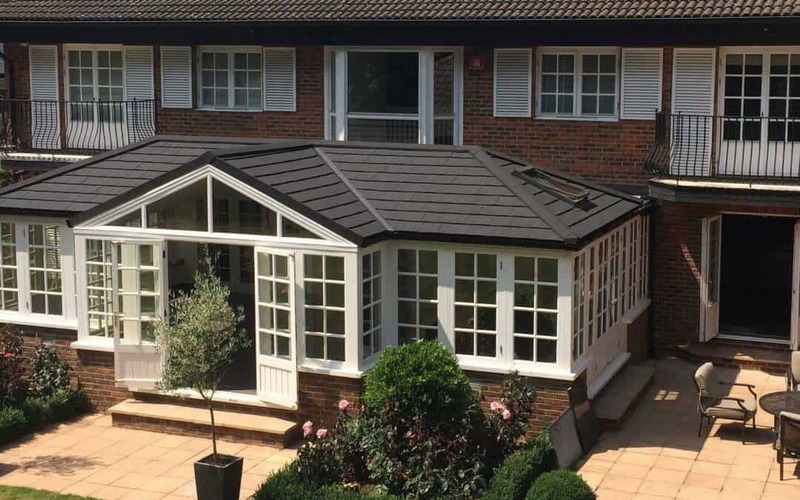 The Guardian Warm roof works by placing multiple layers between the conservatory and the tiled exterior which ensures that your conservatory is able to be used throughout the year. You can check out our helpful video below which explains how the Guardian Warm Roof works. Guardian Roofs UK is the leading manufacturer of the Guardian Warm Roof in the UK – We have team Guardian Members that cover the entirety of the country and are available to help you and answer any questions that you may have. You can find your nearest Guardian Warm Roof Approved Installer by heading to the link provided. We have 10 years of experience in the Guardian Roofing industry and in that time have ensured that the standards we have are the same across the board and that our customers are left feeling confident, happy and pleased with the service that we offer. if you have any questions about the Insulated Conservatory Roof Systems we offer here or any of the other services we offer then please get in touch with a member of the team today and we will be happy to help answer any questions that you may have!